Combine sugar & cornstarch in a medium sized bowl. Add eggs, butter and bourbon or vanilla extract, mix well. Fold in chocolate chips & pecans. Pour into unbaked pastry shell. Bake 40 minutes at 350°. Cool completely before topping with Derby whipped cream. To prepare topping, whip heavy cream with confectioner's sugar. Add bourbon or vanilla and beat until stiff peaks form. Spread over pie. 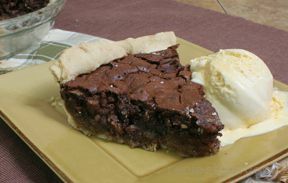 Cooled pie may be covered with foil or plastic wrap and frozen. 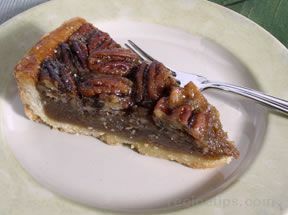 When ready to serve unwrap frozen pie and warm in preheated oven at 300° for 30 to 45 minutes.